I have basically my whole 38 years to scrapbook, and almost 4 years with kids, so I’ve been trying to do multiple pages per week (so easy now that Stampin’ Up! carries several Project Life kits in Stampin’ Up! colors). Last night I decided to make a simple scrapbook page. Most of the work is stamping, and there isn’t a lot else. I started with the photos and the stamps. I’ve been itching to show y’all the For All Things stamp set, which is GORGEOUS, and I knew I had some photos from our two trips to the Pumpkin Patch last year (one with my mom and one with my MIL), so I knew these would be perfect. The photos I chose are from the tractor hayride on the way to pick out pumpkins when we went with my mom. My daughter and I took selfies, or ussies, as my friend Scott Ott refers to ones with more than one person. :) For the second “ussie”, my child got silly, as she is wont to do. We are a rather silly family. 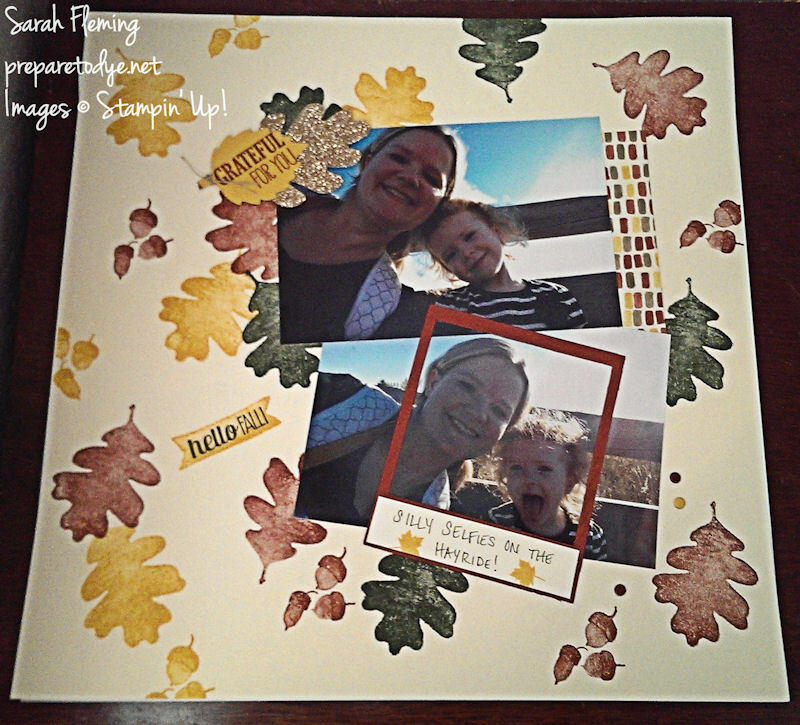 The little piece of designer series paper is from the Color Me Autumn DSP. The colors in the little piece I used are Crushed Curry, Cajun Craze, and Mossy Meadow, so I pulled those colors for my stamping. I love the texture on that leaf! The shading is all in the stamp itself, as is the linen texturing. I didn’t do anything fancy to get the different shades. Several of the stamps in this set are like that. Just beautiful. The little “hello FALL!” sentiment and the banner behind it are also from For All Things, as is “GRATEFUL FOR YOU”. Fabulous set of stamps. So I just stamped a lot of leaves and acorns on my Very Vanilla cardstock, and then, since I had a leaf clump around the top left corner of the top photo, I decided to place the leaf embellishment there as well. The gold leaf is cut from Champagne Glimmer Paper using the Autumn Accents Bigz die. I cut the Crushed Curry leaf with the same die, stamped it, and then attached the two leaves together using Crystal Effects (it’s the best way to get anything to stick on top of the glimmer paper), then tied a little knot of Linen Thread around the leaves and popped them up on Dimensionals. I cut the Polaroid-ish frame out of Cajun Craze cardstock using the On Film framelits/thinlits. I cut the label for that out of Very Vanilla cardstock, wrote my caption with a Mossy Meadow marker, and stamped the tiny maple leaves in Crushed Curry. That stamp is from the Project Life Holiday Cheer set, a fun little set that covers Halloween, fall, and Christmas. The Crushed Curry and Cajun Craze Candy Dots are all from the Regals collection of Candy Dots. I decided to turn this page into a 2-page layout, so this morning I made another page to match, and my next post will show the other page. Happy stamping and scrapping, my friends!